In response to the need for more objective criteria in evaluating the possible artificiality of the objects in Cydonia, Dr. Carlotto applied the well-developed mathematics of fractals to the Viking images. It is often impossible to estimate size and distance of natural features in a landscape because natural features tend to exhibit the same kinds of substructure at different scales. 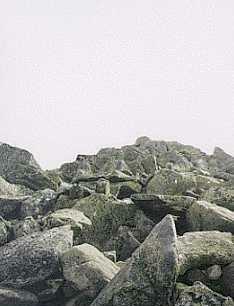 For example, in the pictures of a Katahdin hiking trip, the size of the house-sized boulders on this mountain are not appreciated until one notices the figure of a person among them (figure 11). Nature tends to create “self-similar” substructures. Objects that exhibit this kind of behavior are known as fractals. “The science of fractals has been used with great success to better understand a wide variety of phenomena including electrical discharges, clouds, the distribution of craters on the moon, fluctuations in the stock market, and the shapes of natural terrain and coastlines, to name just a few” (Carlotto 1997). Artificial structures, on the other hand, are essentially non-fractal. As a result, computer algorithms, within determinable probabilities, can discern fractals from non-fractals, natural from artificial. The military has been successful in identifying man-made objects in digital satellite images, as have archeologists in seeking potential archeological ruins. When fractal analysis is applied to the two key Viking frames, the result is that both images of the Face are distinctly non-fractal, rating at the very top end of the fractal fit-error scale (Carlotto 1990). In fact, Carlotto’s fractal analysis revealed the Face has a fit-error curve more pronounced than that of a military vehicle (Hancock 1998). The Fortress, discussed below, also has a high fractal fit-error. The application of fractal mathematics is important because, like probability analyses, it is objective evidence supporting the artificial origins hypothesis. It takes the argument away from the pointless and subjective “it-looks-like/doesn’t-look-like-a-face-to-me” debate. Fractal mathematics says the Face does not fit into the natural terrain, a conclusion most ordinary people can make at a glance (which is exactly how Viking Project scientist Toby Owen, while flipping through countless Viking prints, first discovered the Face back in 1976). The result of Carlotto’s application of fractals is significant, empirical, and objective evidence in support of the hypothesis that the Face, as well as other features in Cydonia, are artificial structures of intelligent design.